Like most parents, I have certain dreams for my children. At the top of the list: I want my three boys to “fly the coop” of my home loving Jesus with all their hearts. In order to do that I believe they must seek to be gospel-centered children as early as possible. And while the bulk of responsibility for their discipleship falls upon me and my wife, the local church has partnered with us in that most weighty of endeavors. Accordingly, our preschool, elementary, middle and high school ministries will have a huge impact on the spiritual direction of my children…and everyone else’s kids who gather there. That should necessitate a question: Does the curriculum our age-graded ministries use help our children to be more gospel-centered? Frankly, it borders on pastoral neglect when those responsible for the doctrine and direction of the entire church assume that what is being taught in their age-graded ministries is sound simply because they have staffed those areas with capable people or because those ministries use a high-dollar, well-endorsed children’s curriculum. Sometimes even our most capable people (and I believe age-graded ministries are full of wonderfully capable people) need someone whose role is to guard the doctrine of the church to come alongside them and intentionally wade through their curriculum, no matter how well-put together and acclaimed it may be. The sad irony is that there are senior pastors who work very hard to make sure their church is gospel-centered from the pulpit, while their other concurrent teaching venues are anything but gospel-centered. That begs another question: What does gospel-centered curriculum look like? Simply put, gospel-centered curriculum is material which demonstrates how the entire Scripture ultimately highlights the beauty, worth, centrality and supremacy of God’s saving action in Jesus’ Person and Work. It reveals how Jesus is the ultimate end of every story, every book and every letter of Scripture. 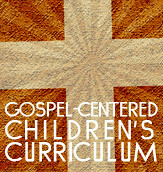 Gospel-centered curriculum takes seriously the approach Jesus took to the Bible when he demonstrated to his disciples in Luke 24:14, “And beginning with Moses and all the Prophets, he interpreted to them in all the Scriptures the things concerning himself.” In Jesus’ mind, the Bible was about him. Gospel-centered curriculum capitalizes on this idea by responsibly demonstrating how everything in the Scriptures points to Jesus, promises Jesus, parallels Jesus, prefigures Jesus, proclaims Jesus, etc. Hopefully, as the listener/learner witnesses the glory of the gospel, his affections will be deeply and profoundly moved for Christ. Put another way, the individual’s heart will grow for Jesus! Totally agree… but I don’t hear a solution. Would love to hear if you have found some golden gospel curriculum, or are we going to have to find it ourselves? I am a pastor in full time ministry for 15 years in South Africa and I totally agree on what you’re saying. I am focussing on Children ages 3-7 years old. There is a big open door to bring the Gospel of Jesus Christ to them. We as Pastors have a big responsibility towards our congregation but a bigger responsibility towards God. You are welcome to have a look at my website.